Discussion in 'V7/V85/V9 Chat & Tech' started by GT-Rx®, Nov 21, 2018. Moto Guzzi did not lose with the new Moto Tourenduro Moto Guzzi V85. The Italians created a sturdy, slightly utilitarian motorcycle that sparked heated discussion and attention from motorcyclists around the world. First of all, the development of a new engine, which will now serve as the basis for other models. In an interview with the Italian magazine Motociclismo, the head of the development of two-wheeled products Antonio Cappellini confirmed that the manufacturer will continue to develop the model range around the new engine. Antonio also said that the road version is already in development. No wonder, quite predictable developments. The new Moto Guzzi engine easily passes the Euro4 standard and will be able to pass the Euro5 tests. The power unit produces 80 hp. Not the highest rate, but the Italian manufacturer does not participate in the battle of performance, relying on other things. It is difficult to say what the next model will be, so just wait for the latest rumors and news. 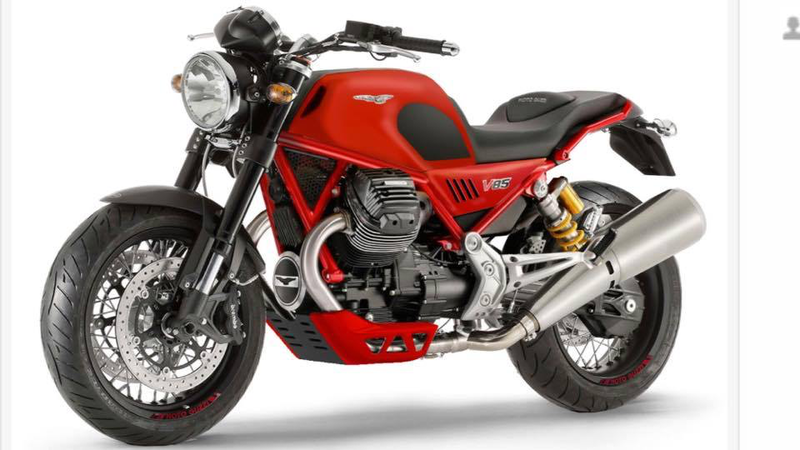 In Europe, the new Moto Guzzi V85 TT will cost 11,500 euros. Available in February 2019. Bill Hagan, Vintagehoarder, TimmyTheHog and 5 others like this. Interesting, I remember seeing a small note on the Moto Guzzi Clan website in about July or August that they were introducing a road bike based on the V85 engine at ECIMA this year, but very shorty after the note was removed and they did not introduce it. I hope that means they are far alone in the development cycle, but just weren't quite ready yet. We'll see. Poppe and Faisal like this. I have seen this "photoshop lash-up" which does look rather good, even though its mirror imaged and backwards. MickE, Mayakovski and Dale Baker like this. I’ve seen that one too. I don’t care for it. I sure hope they just stick it in the V7 platform with updated wider 17” wheels. It’s what they should’ve done with the V9 IMO. Can't wait to see the dyno numbers. I agree. That looks terrible. I'm very curious what they come up with. As mentioned in the rideapart (https://www.rideapart.com/articles/276810/moto-guzzi-v85-new-model/) article on the topic, my hope would be that they come out with a small lightweight MG naked along the lines of the Ducati Monster - something with 16" wheels. If MG is looking to broaden their market share they should think about this. Everybody (inexplicably) LOVES the Monster. [I mean, it's OK...], but this is a segment that MG could expand into, rather than trying to appeal to the same crowd that already has an MG bike. There just isn't the depth in that segment to support another sports-tourer, à la, BMW R series... if they are looking to expand their appeal. Even I would buy a V85, 80 h.p., MG version* of a Ducati Monster! my hope would be that they come out with a small lightweight MG naked along the lines of the Ducati Monster - something with 16" wheels. If we see anywhere near ~65 at the tire, I'll be quite impressed. Chris, you have the best out there with your 820 Quattrovalvole with ~60 rwhp. Perhaps you mean that the GT-Rx 820-4V kit is pure magic?!?? Because it is!! I think my comments were more along the lines of 'MG might consider putting the V85 engine in a shorter wheelbase lightweight minimalistic naked bike if they want to expand their market share'. Even my V7R 820-QV, as a V7, is a longer wheel base platform. MG might open up an entirely new audience by building a bike with the V85 engine that had Monster-like architecture powered with the much more charming and charismatic MG engine. Yes indeed! Too bad hardly anyone took advantage of my offerings. Long over now. The engine/trans layout controls the wheelbase, and they tried that tall/short on the V11 Spine series... which is mediocre at best. Long and low is where it’s at. Wait until you ride a GTM build. I like the looks of the Photoshop Prototype and hope that they come out with something like that, as long as it doesn't get too heavy. One on the things I most like about the V7III Racer is its small, light, low feel. Wheelbase ... heh! To me, Racer feels short and quick. My old Ducati 750GTs and the Guzzi LeMans V were much longer wheelbase, stable as freight trains. But I'm an old fahrt nowadays, all that zooty super-short, high, modern stuff is more than I want to deal with anymore. And it just isn't very pretty like Racer is. I'm looking forward to what comes out of this, seems t me it shouldn't be a difficult task. My V7 Special does all I ask of it so I see no need to make a change and there are other bikes in the garage that satisfy every itch. ... and there are other bikes in the garage that satisfy every itch. Ah! And this is exactly the point that I was making. If Moto Guzzi wants to expand their market range they could make a bike that satisfies one of those 'itches' and, instead of having a non-MG bike in your garage to 'satisfy that itch', it might instead be filled by another Moto Guzzi - something along the lines of the hypothetical MG that I was describing. If MG builds another V7 platform/V7 style bike with the V85 engine, some current owners might exchange their current bike for a new one, but this doesn't recruit new buyers. On the other hand MG might attract a segment of buyers that are more interested in a Monster style bike with an offering along the lines of what I am pitching, and if this is the niche that one of your other (non-MG) bikes currently fills, if you were to buy a new MG to fill that niche, then they have expanded their market share with such an offering. For instance, I don't want/need another V7 in the stable (probably a sentiment shared by many owners), but I would be totally thrilled to add an MG made Monster style bike. but I would be totally thrilled to add an MG made Monster style bike. I would be happy if they would place something performance wise in between their sister company's Tuono and Shiver the Tuono is a great power house but its a bit much where as the shiver is a bit heavy for the power output. Even if they only shave weight from the of road bits and large tank it could be a nice bike for a sporting weekend. The best thing Guzzi could do to strengthen the brand and broaden there market is to improve customer support and expand the dealer net work. Many of my friends, riding buddies, and acquaintances like the Guzzi's I've had but won't make the leap because of the weak support/lack of dealers. With my mix, BMW, Indian, Vespa, Guzzi I'm hedging my bet and not reliant on a single marque. That's just how I roll. Wow! First Indian I've seen with footpegs and controls in a semi-sane location. Le Mans Mark 1 !!! That's just the look I'd want. Hippo-Drones, OregonAl and Poppe like this. I would love to see a road-going V85, but I would even MORE love to see a next-gen Griso even if it were to be water-cooled.